Yes, it’s been a long hard winter. You may even feel that it’s aged you a bit along the way. But did winter actually feel any easier when you were 29? Well, duh. Everything’s easier when you’re 29, right?!! Despite joking with our girlfriends that we’re 29 years old … year, after year … there is something to be said for spending the years with our loved ones. So, grab some tissue and your bestie and head out to see The Age of Adaline. Giveaway details: 10 Prize Packs! 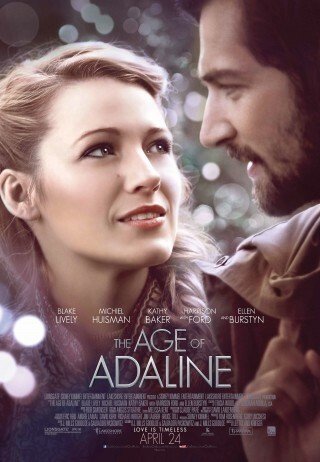 Each prize pack is for 2 tickets to see the Ottawa premiere of The Age of Adaline, taking place at Cineplex (3090 Carling Avenue) on Thursday, April 16th at 7pm. To enter: Leave a comment below telling us what you don’t miss about being 29! Disclosure: These tickets are courtesy of eONE Films. Thanks eONE! I can’t wait to catch some time with my girlfriends and see this new movie. the thought of turning 30 – that is a big milestone! Joy – you are one of the movie ticket winners – congrats! I will email you details. I was pregnant for the first time when I was 29 so, although I liked being pregnant, I can’t say that I “miss” it! Sarah – you are one of the movie ticket winners – congrats! I will email you details. Sleepless nights with new baby! Chandra – you are one of the movie ticket winners – congrats! I will email you details. 29 was a lot of fun, but I don’t miss the uncertainty of my younger years. I prefer my older & wiser self and the confidence that comes with being a “certain” age. Barb – you are one of the movie ticket winners – congrats! I will email you details. I have enjoyed every stage of my life but I do like the comfort and stability that comes with a “few” more years of experience! Helen – you are one of the movie ticket winners – congrats! I will email you details. I don’t miss dreading turning 30 – so far, it’s been an awesome decade! Wish I could have known how much better it would be when I was 29, so I could look forward to it instead! Easy. I don’t miss being with my ex-husband!! Trish – you are one of the movie ticket winners – congrats! I will email you details. I don’t miss all the debt I had! Matt – you are one of the movie ticket winners – congrats! I will email you details. Am I the only one who has nothing sticking in my mind about being 29? Geez! I don’t miss the fear and dread of turning 30…29 was really scary to me because I knew I was almost out of my 30s, it seemed (at the time) so old (haha, I’m laughing now.. several years later). When I turned 30, it wasn’t nearly bad as I’d feared! I saw the preview for this the other day and thought it looked great (who wouldn’t want to stay in their 20s, though really?) and it reminded me a bit of Benjamin Button. A bit different but similar concept. I can’t wait to see this. Dana – you are one of the movie ticket winners – congrats! I will email you details. oops, I meant 29 was scary to me because I knew I was almost out of my 20’s! I haven’t minded any age so far but am so happy where I am I wouldn’t go back to any of them. Jay – you are one of the movie ticket winners – congrats! I will email you details. What I don’t miss about 29 is doubting myself. With the help of good friends and experience the doubt has faded and it’s not missed. Maggie – you are one of the movie ticket winners – congrats! I will email you details. Thank you! So excited to see this movie! Thanks again, Julie!! I loved the movie. I agree, the dog part really pulled at my heartstrings too! My little pooch is almost 13 and I can’t imagine my life without her. That part made me SO sad. Really makes you think too as there are lots of pros not aging, of course, but a few things that would make it hard. What a great movie, and I’m so glad I got to see a sneak preview, thanks to you!